A lack of focus holds back David Attenborough's first foray with Netflix from being truly great, despite fantastic camerawork and Attenborough's perfect narration. When it comes to David Attenborough-led nature documentaries, the question isn’t whether they’ll be any good, but whether they’ll be simply excellent or truly extraordinary. With a CV featuring two spectacular seasons each of Planet Earth and Blue Planet as well as breathtaking deeper dives like Africa, Frozen Planet and last year’s Dynasties all for the BBC, Attenborough has undoubtedly dominated the nature documentary format for at least the last decade and a half. Finding his way over to Netflix for his first-ever collaboration with the streaming giant, we now have Our Planet on our hands: an eight-piece epic miniseries exploring the world’s ecosystems, from frozen tundras to scorching deserts and everything in between. The question, of its introductory episode ‘One Planet’, is of course: is it simply excellent, or truly extraordinary? Unfortunately, things get off to a less-than-spectacular start. You can tell the producers were aiming for a heart-stopping introductory story in the same vein as that daredevil iguana from Planet Earth 2. Focusing on a feeding frenzy at sea, we’re treated to stunning cinematography as birds dive-bomb the depths in search of food. It certainly makes for impressive viewing, with wide-angle shots and slow-motion galore, but you can’t help shake the feeling that something’s missing. There doesn’t seem to be any real narrative focus here, no-one for us to root for, no story for us to follow with a clear end-point at which the show can transition to another section. Instead, we cut across to the salt pans of Africa in a somewhat jarring juxtaposition of visuals and pacing. Now, the focus is on the quest for water, especially for a huge flock of flamingos after a rare torrential rainfall floods the normally-barren landscape with water – before being sapped away just as quickly by the scorching summer sun. Attenborough nature documentaries have never failed to make us feel for animals in predicaments, and that remains the case here as we follow hundreds of baby flamingos making the perilous trek across the salt pans to fresh water. Delicate narration and ultra-close-up camera shots of chicks who look unlikely to survive the journey make for one of the most heart-wrenching moments of the entire episode – and, importantly, give the segment some focus. One of the strengths of last year’s Dynasties was its ability to take a deep dive into certain animals’ lives, letting us in on the various victories and setbacks over the months or years of filming. Though that’s more difficult to achieve here, where each animal receives a five or 10-minute segment as opposed to a whole hour. Keeping the focus on certain animals or their families and the perils they face keeps the on-screen action grounded and engaging, and is something the opening segment of this opening episode is sadly lacking. From there, we’re transported on a further whistle-stop tour of the globe, stopping in on a pack of wolves chasing caribou, a pack of wild dogs chasing wildebeast, and the obligatory bird mating routine. As with any Attenborough documentary, the cinematography is exquisite, capturing the beauty of nature in jaw-dropping glory. Meanwhile, Attenborough’s narration is as examplary as ever, perfectly conveying the tone of the scene and revealing hidden detail beyond the camera lens. There’s an unfornate lack of action – both chase scenes end abruptly, and with the prey getting away with relative ease – but the camera crew do what they can to keep our hearts racing and our curiosity engaged throughout. 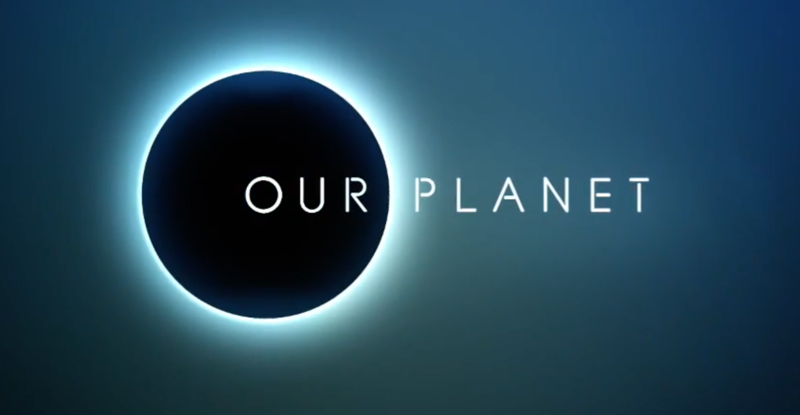 In the end, it lands Our Planet‘s opening episode on the “simply excellent” end of the Attenborough spectrum, as opposed to some of the “truly extraordinary” episodes we’d gotten used to seeing in the recent Blue Planet 2 and Dynasties. It’s a finely-crafter hour of entertainment – with an honourable call-to-arms on climate change to boot – but a lack in drama and an occasional dip in focus mean that all too often, despite astounding camerawork and Attenborough’s assured delivery, it feels like that special something has unfortunately gone missing. With later episodes in the series focusing on specific biomes and ecosystems rather than criss-crossing around the globe, one can hope that the quality can pick up to match the same lofty heights that we know an Attenborough documentary can reach. With ‘One Planet’, however, we have an assured introductory episode, but one which lacks that special panache. All 8 episodes of Our Planet are available now on Netflix.